Working with people who are polar-opposite from your personality can be challenging, but none more so than when the left-brained “noncreatives” meets the right-brained “creatives,” and vice versa. 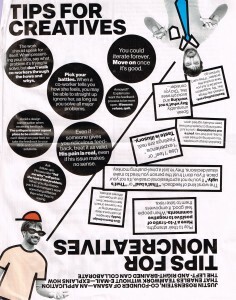 From Bloomberg Businessweek (Mar 24-Apr 6 2014) this intelligent article by Justin Rosenstein outlines several practical suggestions for both left- and right-brained people to collaborate effectively with their counterparts. Play to their strengths. Have a 7-to-1 ratio of positive to negative comments. When people feel good, it empowers them to take risks. Give them a design buddy. Managers should have a deep understanding of the nuances of each team member, then pair up those with different skill sets. The worst kind of feedback: “That’s bad” or “That’s ugly.” If you’re not a professional creative, it’s not your place. If you don’t trust the person you hired to make visual decisions, they’re just a pixel-pushing monkey. Use “I feel” or “I experience.” Feelings are real. Taste is illusory. Establish design principles. You can bring up these attributes, and that way you’re not complaining – you’re just mentioning concepts that have been mutually agreed upon. Resist pulling rank. Instead, say things like, “My suggestion would be X, but you have to solve this problem.” If they can’t, let them go. The work should speak for itself. When presenting your idea, say what problem it’s trying to solve, but don’t walk co-workers through the hows and whys. Pick your battles. When a co-worker tells you how she feels, you may be able to straight up ignore her, as long as you solve all major problems. You could iterate forever. Move on once it’s good. Even if someone gives you ridiculous feedback, treat it as valid. His pain is real, even if his issue makes no sense. Avoid a design conversation when receiving feedback. The critique is never a good place to be creative. You can’t design on your feet, so take the feedback to your desk and consider solutions. Ask follow-ups. Phrases like “Tell me why” will get to the root of the problem. When you dig deeper, you’ll find managers want something different than what they’re saying. Annoyed? Explain you want the feedback process to be more open. If bosses refuse, quit. Some of the points here are reflected in another post on this subject: Left Brained Thinking, from 26 April 2010. Any other suggestions for working with creatives and noncreatives? Interesting thoughts. Thanks for the article. I agree that the author’s suggestions sound a bit harsh, but it’s also a different career environment than it was from my earliest days in PR. It’s very difficult to keep good (young) people nowadays because there are so many other opportunities out there. It’s too bad that people my age (your age?) don’t have that same opportunity, given the rush by HR people to simply hire the cheapest people they can find. That’s why “quit” isn’t an option for me, not now. Welcome to 21st century employment practices – particularly in the tech industry – where the natural laws of supply and demand no longer easily apply. If it wasn’t clear, the author Justin Rosenstein is co-founder of Asana, a web/mobile app which seeks to improve teamwork without the use of email. If the non-creative can’t fix the problem, let them go? If bosses refuse more open feedback, quit? The burning of Covey and Carnegie books begin at midnight, correct?